To reduce the development of drug-resistant bacteria and maintain the effectiveness of AVELOX® and other antibacterial drugs, AVELOX should be used only to treat or prevent infections that are proven or strongly suspected to be caused by bacteria. AVELOX Tablets are available as film-coated tablets containing moxifloxacin hydrochloride (equivalent to 400 mg moxifloxacin). The inactive ingredients are microcrystalline cellulose, lactose monohydrate, croscarmellose sodium, magnesium stearate, hypromellose, titanium dioxide, polyethylene glycol and ferric oxide. AVELOX I.V. is available in ready-to-use 250 mL latex-free flexibags as a sterile, preservative free, 0.8% sodium chloride aqueous solution of moxifloxacin hydrochloride (containing 400 mg moxifloxacin) with pH ranging from 4.1 to 4.6. The appearance of the intravenous solution is yellow. The color does not affect, nor is it indicative of, product stability. The inactive ingredients are sodium chloride, USP, Water for Injection, USP, and may include hydrochloric acid and/or sodium hydroxide for pH adjustment. Moxifloxacin, given as an oral tablet, is well absorbed from the gastrointestinal tract. The absolute bioavailability of moxifloxacin is approximately 90 percent. Co-administration with a high fat meal (i.e., 500 calories from fat) does not affect the absorption of moxifloxacin. Consumption of 1 cup of yogurt with moxifloxacin does not significantly affect the extent or rate of systemic absorption (AUC). The mean (± SD) C max and AUC values following single and multiple doses of 400 mg moxifloxacin given orally are summarized below. The mean (± SD) C max and AUC values following single and multiple doses of 400 mg moxifloxacin given by 1 hour I.V. infusion are summarized below. Moxifloxacin is approximately 50% bound to serum proteins, independent of drug concentration. The volume of distribution of moxifloxacin ranges from 1.7 to 2.7 L/kg. Moxifloxacin is widely distributed throughout the body, with tissue concentrations often exceeding plasma concentrations. Moxifloxacin has been detected in the saliva, nasal and bronchial secretions, mucosa of the sinuses, skin blister fluid, and subcutaneous tissue, and skeletal muscle following oral or intravenous administration of 400 mg. Concentrations measured at 3 hours following a 400 mg oral dose in healthy volunteers are summarized in the following table. The rates of elimination of moxifloxacin from tissues generally parallel the elimination from plasma. § all moxifloxacin concentrations were measured after a single 400 mg dose, except the sinus concentrations which were measured after 5 days of dosing. *Reflects only non-protein bound concentrations of drug. Approximately 45% of an oral or intravenous dose of moxifloxacin is excreted as unchanged drug (~20% in urine and ~25% in feces). A total of 96% ± 4% of an oral dose is excreted as either unchanged drug or known metabolites. The mean (± SD) apparent total body clearance and renal clearance are 12 ± 2.0 L/hr and 2.6 ± 0.5 L/hr, respectively. Following oral administration of 400 mg moxifloxacin for 10 days in 16 elderly (8 male; 8 female) and 17 young (8 male; 9 female) healthy volunteers, there were no age-related changes in moxifloxacin pharmacokinetics. In 16 healthy male volunteers (8 young; 8 elderly) given a single 200 mg dose of oral moxifloxacin, the extent of systemic exposure (AUC and C max ) was not statistically different between young and elderly males and elimination half-life was unchanged. No dosage adjustment is necessary based on age. In large phase III studies, the concentrations around the time of the end of the infusion in elderly patients following intravenous infusion of 400 mg were similar to those observed in young patients. Following oral administration of 400 mg moxifloxacin daily for 10 days to 23 healthy males (19-75 years) and 24 healthy females (19-70 years), the mean AUC and C max were 8% and 16% higher, respectively, in females compared to males. There are no significant differences in moxifloxacin pharmacokinetics between male and female subjects when differences in body weight are taken into consideration. A 400 mg single dose study was conducted in 18 young males and females. The comparison of moxifloxacin pharmacokinetics in this study (9 young females and 9 young males) showed no differences in AUC or C max due to gender. Dosage adjustments based on gender are not necessary. Steady-state moxifloxacin pharmacokinetics in male Japanese subjects were similar to those determined in Caucasians, with a mean C max of 4.1 µg/mL, an AUC 24 of 47 µg·h/mL, and an elimination half-life of 14 hours, following 400 mg p.o. daily. In a single oral dose study of 24 patients with varying degrees of renal function from normal to severely impaired, the mean peak concentrations (C max ) of moxifloxacin were reduced by 21% and 28% in the patients with moderate (CL CR >/= 30 and </=60 mL/min) and severe (CL CR <30 mL/min) renal impairment, respectively. The mean systemic exposure (AUC) in these patients was increased by 13%. In the moderate and severe renally impaired patients, the mean AUC for the sulfate conjugate (M1) increased by 1.7-fold (ranging up to 2.8-fold) and mean AUC and C max for the glucuronide conjugate (M2) increased by 2.8-fold (ranging up to 4.8-fold) and 1.4-fold (ranging up to 2.5-fold), respectively. The pharmacokinetics of single dose and multiple dose moxifloxacin were studied in patients with CL CR < 20 mL/min on either hemodialysis or continuous ambulatory peritoneal dialysis (8 HD, 8 CAPD). Following a single 400 mg oral dose, the AUC of moxifloxacin in these HD and CAPD patients did not vary significantly from the AUC generally found in healthy volunteers. C max values of moxifloxacin were reduced by about 45% and 33% in HD and CAPD patients, respectively, compared to healthy, historical controls. The exposure (AUC) to the sulfate conjugate (M1) increased by 1.4- to 1.5-fold in these patients. The mean AUC of the glucuronide conjugate (M2) increased by a factor of 7.5, whereas the mean C max values of the glucuronide conjugate (M2) increased by a factor of 2.5 to 3, compared to healthy subjects. The sulfate and the glucuronide conjugates of moxifloxacin are not microbiologically active, and the clinical implication of increased exposure to these metabolites in patients with renal disease including those undergoing HD and CAPD has not been studied. Oral administration of 400 mg QD moxifloxacin for 7 days to patients on HD or CAPD produced mean systemic exposure (AUC ss ) to moxifloxacin similar to that generally seen in healthy volunteers. Steady-state C max values were about 22% lower in HD patients but were comparable between CAPD patients and healthy volunteers. Both HD and CAPD removed only small amounts of moxifloxacin from the body (approximately 9% by HD, and 3% by CAPD). HD and CAPD also removed about 4% and 2% of the glucuronide metabolite (M2), respectively. In 400 mg single oral dose studies in 6 patients with mild (Child Pugh Class A), and 10 patients with moderate (Child Pugh Class B), hepatic insufficiency, moxifloxacin mean systemic exposure (AUC) was 78% and 102%, respectively, of 18 healthy controls and mean peak concentration (C max ) was 79% and 84% of controls. The potential for pharmacokinetic drug interactions between moxifloxacin and itraconazole, theophylline, warfarin, digoxin, atenolol, probenecid, morphine, oral contraceptives, ranitidine, glyburide, calcium, iron, and antacids has been evaluated. There was no clinically significant effect of moxifloxacin on itraconazole, theophylline, warfarin, digoxin, atenolol, oral contraceptives, or glyburide kinetics. Itraconazole, theophylline, warfarin, digoxin, probenecid, morphine, ranitidine, and calcium did not significantly affect the pharmacokinetics of moxifloxacin. These results and the data from in vitro studies suggest that moxifloxacin is unlikely to significantly alter the metabolic clearance of drugs metabolized by CYP3A4, CYP2D6, CYP2C9, CYP2C19, or CYP1A2 enzymes. As with all other quinolones, iron and antacids significantly reduced bioavailability of moxifloxacin. Itraconazole: In a study involving 11 healthy volunteers, there was no significant effect of itraconazole (200 mg once daily for 9 days), a potent inhibitor of cytochrome P4503A4, on the pharmacokinetics of moxifloxacin (a single 400 mg dose given on the 7 th day of itraconazole dosing). In addition, moxifloxacin was shown not to affect the pharmacokinetics of itraconazole. Theophylline: No significant effect of moxifloxacin (200 mg every twelve hours for 3 days) on the pharmacokinetics of theophylline (400 mg every twelve hours for 3 days) was detected in a study involving 12 healthy volunteers. In addition, theophylline was not shown to affect the pharmacokinetics of moxifloxacin. The effect of co-administration of a 400 mg dose of moxifloxacin with theophylline has not been studied, but it is not expected to be clinically significant based on in vitro metabolic data showing that moxifloxacin does not inhibit the CYP1A2 isoenzyme. Digoxin: No significant effect of moxifloxacin (400 mg once daily for two days) on digoxin (0.6 mg as a single dose) AUC was detected in a study involving 12 healthy volunteers. The mean digoxin C max increased by about 50% during the distribution phase of digoxin. This transient increase in digoxin C max is not viewed to be clinically significant. Moxifloxacin pharmacokinetics were similar in the presence or absence of digoxin. No dosage adjustment for moxifloxacin or digoxin is required when these drugs are administered concomitantly. Atenolol: In a crossover study involving 24 healthy volunteers (12 male; 12 female), the mean atenolol AUC following a single oral dose of 50 mg atenolol with placebo was similar to that observed when atenolol was given concomitantly with a single 400 mg oral dose of moxifloxacin. The mean C max of single dose atenolol decreased by about 10% following co-administration with a single dose of moxifloxacin. Morphine: No significant effect of morphine sulfate (a single 10 mg intramuscular dose) on the mean AUC and C max of moxifloxacin (400 mg single dose) was observed in a study of 20 healthy male and female volunteers. Oral Contraceptives: A placebo-controlled study in 29 healthy female subjects showed that moxifloxacin 400 mg daily for 7 days did not interfere with the hormonal suppression of oral contraception with 0.15 mg levonorgestrel/0.03 mg ethinylestradiol (as measured by serum progesterone, FSH, estradiol, and LH), or with the pharmacokinetics of the administered contraceptive agents. Probenecid: Probenecid (500 mg twice daily for two days) did not alter the renal clearance and total amount of moxifloxacin (400 mg single dose) excreted renally in a study of 12 healthy volunteers. Ranitidine: No significant effect of ranitidine (150 mg twice daily for three days as pretreatment) on the pharmacokinetics of moxifloxacin (400 mg single dose) was detected in a study involving 10 healthy volunteers. Antidiabetic agents: In diabetics, glyburide (2.5 mg once daily for two weeks pretreatment and for five days concurrently) mean AUC and C max were 12% and 21% lower, respectively, when taken with moxifloxacin (400 mg once daily for five days) in comparison to placebo. Nonetheless, blood glucose levels were decreased slightly in patients taking glyburide and moxifloxacin in comparison to those taking glyburide alone, suggesting no interference by moxifloxacin on the activity of glyburide. These interaction results are not viewed as clinically significant. Calcium: Twelve healthy volunteers were administered concomitant moxifloxacin (single 400 mg dose) and calcium (single dose of 500 mg Ca ++ dietary supplement) followed by an additional two doses of calcium 12 and 24 hours after moxifloxacin administration. Calcium had no significant effect on the mean AUC of moxifloxacin. 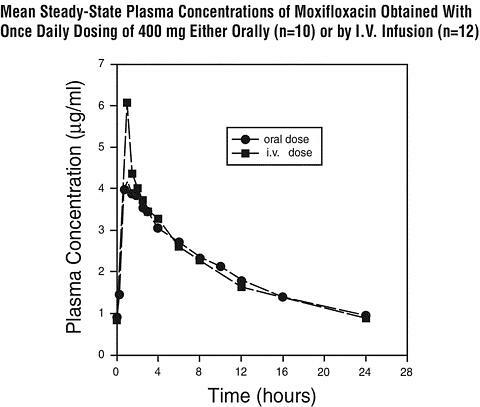 The mean C max was slightly reduced and the time to maximum plasma concentration was prolonged when moxifloxacin was given with calcium compared to when moxifloxacin was given alone (2.5 hours versus 0.9 hours). These differences are not considered to be clinically significant. Moxifloxacin has in vitro activity against a wide range of Gram-positive and Gram-negative microorganisms. The bactericidal action of moxifloxacin results from inhibition of the topoisomerase II (DNA gyrase) and topoisomerase IV required for bacterial DNA replication, transcription, repair, and recombination. It appears that the C8-methoxy moiety contributes to enhanced activity and lower selection of resistant mutants of Gram-positive bacteria compared to the C8-H moiety. The presence of the bulky bicycloamine substituent at the C-7 position prevents active efflux, associated with the NorA or pmrA genes seen in certain Gram-positive bacteria. The mechanism of action for quinolones, including moxifloxacin, is different from that of macrolides, beta-lactams, aminoglycosides, or tetracyclines; therefore, microorganisms resistant to these classes of drugs may be susceptible to moxifloxacin and other quinolones. There is no known cross-resistance between moxifloxacin and other classes of antimicrobials. In vitro resistance to moxifloxacin develops slowly via multiple-step mutations. Resistance to moxifloxacin occurs in vitro at a general frequency of between 1.8 × 10 -9 to < 1 × 10 -11 for Gram-positive bacteria. Cross-resistance has been observed between moxifloxacin and other fluoroquinolones against Gram-negative bacteria. Gram-positive bacteria resistant to other fluoroquinolones may, however, still be susceptible to moxifloxacin. Moxifloxacin has been shown to be active against most strains of the following microorganisms, both in vitro and in clinical infections as described in the INDICATIONS AND USAGE section. * MDRSP, Multi-drug resistant Streptococcus pneumoniae includes isolates previously known as PRSP (Penicillin-resistant S. pneumoniae ), and are strains resistant to two or more of the following antibiotics: penicillin (MIC >/= 2 µg/mL) 2 nd generation cephalosporins (e.g., cefuroxime), macrolides, tetracyclines, and trimethoprim/sulfamethoxazole. Moxifloxacin exhibits in vitro minimum inhibitory concentrations (MICs) of 2 µg/mL or less against most (>/= 90%) strains of the following microorganisms; however, the safety and effectiveness of moxifloxacin in treating clinical infections due to these microorganisms have not been established in adequate and well-controlled clinical trials. a This interpretive standard is applicable only to broth microdilution susceptibility tests with Haemophilus influenzae and Haemophilus parainfluenzae using Haemophilus Test Medium 1 . The current absence of data on resistant strains precludes defining any results other than "Susceptible". Strains yielding MIC results suggestive of a "nonsusceptible" category should be submitted to a reference laboratory for further testing. b This interpretive standard is applicable only to broth microdilution susceptibility tests using cation-adjusted Mueller-Hinton broth with 2-5% lysed horse blood. A report of "Susceptible" indicates that the pathogen is likely to be inhibited if the antimicrobial compound in the blood reaches the concentrations usually achievable. A report of "Intermediate" indicates that the result should be considered equivocal, and, if the microorganism is not fully susceptible to alternative, clinically feasible drugs, the test should be repeated. This category implies possible clinical applicability in body sites where the drug is physiologically concentrated or in situations where a high dosage of drug can be used. This category also provides a buffer zone which prevents small uncontrolled technical factors from causing major discrepancies in interpretation. A report of "Resistant" indicates that the pathogen is not likely to be inhibited if the antimicrobial compound in the blood reaches the concentrations usually achievable; other therapy should be selected. c This quality control range is applicable to only H. influenzae ATCC 49247 tested by a broth microdilution procedure using Haemophilus Test Medium (HTM) 1 .
d This quality control range is applicable to only S. pneumoniae ATCC 49619 tested by a broth microdilution procedure using cation-adjusted Mueller-Hinton broth with 2-5% lysed horse blood. Diffusion Techniques: Quantitative methods that require measurement of zone diameters also provide reproducible estimates of the susceptibility of bacteria to antimicrobial compounds. One such standardized procedure 2 requires the use of standardized inoculum concentrations. This procedure uses paper disks impregnated with 5-µg moxifloxacin to test the susceptibility of microorganisms to moxifloxacin. e This zone diameter standard is applicable only to tests with Haemophilus influenzae and Haemophilus parainfluenzae using Haemophilus Test Medium (HTM) 2 . The current absence of data on resistant strains precludes defining any results other than "Susceptible". Strains yielding zone diameter results suggestive of a "nonsusceptible" category should be submitted to a reference laboratory for further testing. f These interpretive standards are applicable only to disk diffusion tests using Mueller-Hinton agar supplemented with 5% sheep blood incubated in 5% CO 2 . Interpretation should be as stated above for results using dilution techniques. Interpretation involves correlation of the diameter obtained in the disk test with the MIC for moxifloxacin. g These quality control limits are applicable to only H. influenzae ATCC 49247 testing using Haemophilus Test Medium (HTM) 2 .
h These quality control limits are applicable only to tests conducted with S. pneumoniae ATCC 49619 performed by disk diffusion using Mueller-Hinton agar supplemented with 5% defibrinated sheep blood. Acute Bacterial Sinusitis caused by Streptococcus pneumoniae, Haemophilus influenzae, or Moraxella catarrhalis . Acute Bacterial Exacerbation of Chronic Bronchitis caused by Streptococcus pneumoniae, Haemophilus influenzae, Haemophilus parainfluenzae, Klebsiella pneumoniae, Staphylococcus aureus, or Moraxella catarrhalis . Community Acquired Pneumonia caused by Streptococcus pneumoniae (including multi-drug resistant strains * ), Haemophilus influenzae, Moraxella catarrhalis, Staphylococcus aureus, Klebsiella pneumoniae, Mycoplasma pneumoniae, or Chlamydia pneumoniae . * MDRSP, Multi-drug resistant Streptococcus pneumoniae includes isolates previously known as PRSP (Penicillin-resistant S. pneumoniae ), and are strains resistant to two or more of the following antibiotics: penicillin (MIC >/= 2 µg/mL), 2 nd generation cephalosporins (e.g., cefuroxime), macrolides, tetracyclines, and trimethoprim/sulfamethoxazole. Uncomplicated Skin and Skin Structure Infections caused by Staphylococcus aureus or Streptococcus pyogenes . Complicated Skin and Skin Structure Infections caused by methicillin-susceptible Staphylococcus aureus, Escherichia coli, Klebsiella pneumoniae , or Enterobacter cloacae (See Clinical Studies ). Appropriate culture and susceptibility tests should be performed before treatment in order to isolate and identify organisms causing infection and to determine their susceptibility to moxifloxacin. Therapy with AVELOX may be initiated before results of these tests are known; once results become available, appropriate therapy should be continued. To reduce the development of drug-resistant bacteria and maintain the effectiveness of AVELOX and other antibacterial drugs, AVELOX should be used only to treat or prevent infections that are proven or strongly suspected to be caused by susceptible bacteria. When culture and susceptibility information are available, they should be considered in selecting or modifying antibacterial therapy. In the absence of such data, local epidemiology and susceptibility patterns may contribute to the empiric selection of therapy. Moxifloxacin has been shown to prolong the QT interval of the electrocardiogram in some patients. The drug should be avoided in patients with known prolongation of the QT interval, patients with uncorrected hypokalemia and patients receiving Class IA (e.g., quinidine, procainamide) or Class III (e.g., amiodarone, sotalol) antiarrhythmic agents, due to the lack of clinical experience with the drug in these patient populations. Pharmacokinetic studies between moxifloxacin and other drugs that prolong the QT interval such as cisapride, erythromycin, antipsychotics, and tricyclic antidepressants have not been performed. An additive effect of moxifloxacin and these drugs cannot be excluded, therefore caution should be exercised when moxifloxacin is given concurrently with these drugs. In premarketing clinical trials, the rate of cardiovascular adverse events was similar in 798 moxifloxacin and 702 comparator treated patients who received concomitant therapy with drugs known to prolong the QTc interval. Serious anaphylactic reactions, some following the first dose, have been reported in patients receiving quinolone therapy, including moxifloxacin. Some reactions were accompanied by cardiovascular collapse, loss of consciousness, tingling, pharyngeal or facial edema, dyspnea, urticaria, and itching. Serious anaphylactic reactions require immediate emergency treatment with epinephrine. Moxifloxacin should be discontinued at the first appearance of a skin rash or any other sign of hypersensitivity. Oxygen, intravenous steroids, and airway management, including intubation, may be administered as indicated. Severe and sometimes fatal events, some due to hypersensitivity, and some of uncertain etiology, have been reported in patients receiving therapy with all antibiotics. These events may be severe and generally occur following the administration of multiple doses. Clinical manifestations may include one or more of the following: rash, fever, eosinophilia, jaundice, and hepatic necrosis. Treatment with antibacterial agents alters the normal flora of the colon and may permit overgrowth of clostridia. Studies indicate that a toxin produced by Clostridium difficile is one primary cause of "antibiotic-associated colitis." After the diagnosis of pseudomembranous colitis has been established, therapeutic measures should be initiated. Mild cases of pseudomembranous colitis usually respond to drug discontinuation alone. In moderate to severe cases, consideration should be given to management with fluids and electrolytes, protein supplementation, and treatment with an antibacterial drug clinically effective against C. difficile colitis. Peripheral neuropathy: Rare cases of sensory or sensorimotor axonal polyneuropathy affecting small and/or large axons resulting in paresthesias, hypoesthesias, dysesthesias and weakness have been reported in patients receiving quinolones. Tendon Effects: Ruptures of the shoulder, hand, Achilles tendon or other tendons that required surgical repair or resulted in prolonged disability have been reported in patients receiving quinolones, including moxifloxacin. Post-marketing surveillance reports indicate that this risk may be increased in patients receiving concomitant corticosteroids, especially the elderly. Moxifloxacin should be discontinued if the patient experiences pain, inflammation, or rupture of a tendon. Patients should rest and refrain from exercise until the diagnosis of tendonitis or tendon rupture has been excluded. Tendon rupture can occur during or after therapy with quinolones, including moxifloxacin. Prescribing AVELOX in the absence of a proven or strongly suspected bacterial infection or a prophylactic indication is unlikely to provide benefit to the patient and increases the risk of the development of drug-resistant bacteria. that antibacterial drugs including AVELOX should only be used to treat bacterial infections. They do not treat viral infections (e.g., the common cold). When AVELOX is prescribed to treat a bacterial infection, patients should be told that although it is common to feel better early in the course of therapy, the medication should be taken exactly as directed. Skipping doses or not completing the full course of therapy may (1) decrease the effectiveness of the immediate treatment and (2) increase the likelihood that bacteria will develop resistance and will not be treatable by AVELOX or other antibacterial drugs in the future. that moxifloxacin may produce changes in the electrocardiogram (QTc interval prolongation). that moxifloxacin should be avoided in patients receiving Class IA (e.g. quinidine, procainamide) or Class III (e.g. amiodarone, sotalol) antiarrhythmic agents. that moxifloxacin may add to the QTc prolonging effects of other drugs such as cisapride, erythromycin, antipsychotics, and tricyclic antidepressants. to inform their physician of any personal or family history of QTc prolongation or proarrhythmic conditions such as recent hypokalemia, significant bradycardia, acute myocardial ischemia. to inform their physician of any other medications when taken concurrently with moxifloxacin, including over-the-counter medications. to contact their physician if they experience palpitations or fainting spells while taking moxifloxacin. that moxifloxacin tablets may be taken with or without meals, and to drink fluids liberally. that moxifloxacin may be associated with hypersensitivity reactions, including anaphylactic reactions, even following a single dose, and to discontinue the drug at the first sign of a skin rash or other signs of an allergic reaction. to discontinue treatment; rest and refrain from exercise; and inform their physician if they experience pain, inflammation, or rupture of a tendon. that moxifloxacin may cause dizziness and lightheadedness; therefore, patients should know how they react to this drug before they operate an automobile or machinery or engage in activities requiring mental alertness or coordination. that convulsions have been reported in patients receiving quinolones, and they should notify their physician before taking this drug if there is a history of this condition. Warfarin: No significant effect of moxifloxacin on R- and S-warfarin was detected in a clinical study involving 24 healthy volunteers. No significant changes in prothrombin time were noted in the presence of moxifloxacin. 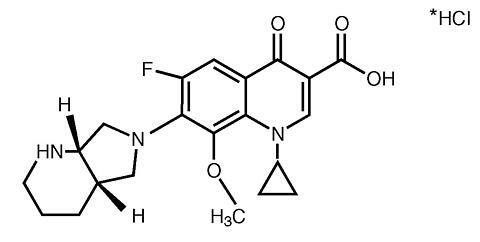 Quinolones, including moxifloxacin, have been reported to enhance the anticoagulant effects of warfarin or its derivatives in the patient population. In addition, infectious disease and its accompanying inflammatory process, age, and general status of the patient are risk factors for increased anticoagulant activity. Therefore the prothrombin time, International Normalized Ratio (INR), or other suitable anticoagulation tests should be closely monitored if a quinolone is administered concomitantly with warfarin or its derivatives. Drugs metabolized by Cytochrome P450 enzymes: In vitro studies with cytochrome P450 isoenzymes (CYP) indicate that moxifloxacin does not inhibit CYP3A4, CYP2D6, CYP2C9, CYP2C19, or CYP1A2, suggesting that moxifloxacin is unlikely to alter the pharmacokinetics of drugs metabolized by these enzymes (e.g. midazolam, cyclosporine, warfarin, theophylline). Moxifloxacin had no effect on fertility in male and female rats at oral doses as high as 500 mg/kg/day, approximately 12 times the maximum recommended human dose based on body surface area (mg/m 2 ), or at intravenous doses as high as 45 mg/kg/day, approximately equal to the maximum recommended human dose based on body surface area (mg/m 2 ). At 500 mg/kg orally there were slight effects on sperm morphology (head-tail separation) in male rats and on the estrous cycle in female rats. Moxifloxacin was not teratogenic when administered to pregnant rats during organogenesis at oral doses as high as 500 mg/kg/day or 0.24 times the maximum recommended human dose based on systemic exposure (AUC), but decreased fetal body weights and slightly delayed fetal skeletal development (indicative of fetotoxicity) were observed. Intravenous administration of 80 mg/kg/day (approximately 2 times the maximum recommended human dose based on body surface area (mg/m 2 )) to pregnant rats resulted in maternal toxicity and a marginal effect on fetal and placental weights and the appearance of the placenta. There was no evidence of teratogenicity at intravenous doses as high as 80 mg/kg/day. Intravenous administration of 20 mg/kg/day (approximately equal to the maximum recommended human oral dose based upon systemic exposure) to pregnant rabbits during organogenesis resulted in decreased fetal body weights and delayed fetal skeletal ossification. When rib and vertebral malformations were combined, there was an increased fetal and litter incidence of these effects. Signs of maternal toxicity in rabbits at this dose included mortality, abortions, marked reduction of food consumption, decreased water intake, body weight loss and hypoactivity. There was no evidence of teratogenicity when pregnant Cynomolgus monkeys were given oral doses as high as 100 mg/kg/day (2.5 times the maximum recommended human dose based upon systemic exposure). An increased incidence of smaller fetuses was observed at 100 mg/kg/day. In an oral pre- and postnatal development study conducted in rats, effects observed at 500 mg/kg/day included slight increases in duration of pregnancy and prenatal loss, reduced pup birth weight and decreased neonatal survival. Treatment-related maternal mortality occurred during gestation at 500 mg/kg/day in this study. Since there are no adequate or well-controlled studies in pregnant women, moxifloxacin should be used during pregnancy only if the potential benefit justifies the potential risk to the fetus. Moxifloxacin is excreted in the breast milk of rats. Moxifloxacin may also be excreted in human milk. Because of the potential for serious adverse reactions in infants nursing from mothers taking moxifloxacin, a decision should be made whether to discontinue nursing or to discontinue the drug, taking into account the importance of the drug to the mother. In intravenous trials in community acquired pneumonia, 45% of moxifloxacin patients were greater than or equal to 65 years of age, and 24% were greater than or equal to 75 years of age. In the pool of 491 elderly (> 65 years) patients, the following ECG abnormalities were reported in moxifloxacin vs. comparator patients: ST-T wave changes (2 events vs. 0 events), QT prolongation (2 vs. 0), ventricular tachycardia (1 vs. 0), atrial flutter (1 vs. 0), tachycardia (2 vs. 1), atrial fibrillation (1 vs. 0), supraventricular tachycardia (1 vs. 0), ventricular extrasystoles (2 vs. 0), and arrhythmia (0 vs. 1). None of the abnormalities was associated with a fatal outcome and a majority of these patients completed a full course of therapy. Clinical efficacy trials enrolled over 8,600 moxifloxacin orally and intravenously treated patients, of whom over 8,000 patients received the 400 mg dose. Most adverse events reported in moxifloxacin trials were described as mild to moderate in severity and required no treatment. Moxifloxacin was discontinued due to adverse reactions thought to be drug-related in 2.9% of orally treated patients and 4.6 % of sequentially (intravenous followed by oral) treated patients. The latter studies were conducted in community acquired pneumonia and complicated skin and skin structure infections with, in general, a sicker patient population compared to the tablet studies. Additional adverse events have been reported from worldwide post-marketing experience with moxifloxacin. Because these events are reported voluntarily from a population of uncertain size, it is not always possible to reliably estimate their frequency or establish a causal relationship to drug exposure. These events, some of them life-threatening, include anaphylactic reaction, anaphylactic shock, angioedema (including laryngeal edema), hepatitis (predominantly cholestatic), psychotic reaction, Stevens-Johnson syndrome, tendon rupture, and ventricular tachyarrhythmias (including in very rare cases cardiac arrest and torsade de pointes, and usually in patients with concurrent severe underlying proarrhythmic conditions). Changes in laboratory parameters, without regard to drug relationship, which are not listed above and which occurred in >/= 2% of patients and at an incidence greater than in controls included: increases in MCH, neutrophils, WBCs, PT ratio, ionized calcium, chloride, albumin, globulin, bilirubin; decreases in hemoglobin, RBCs, neutrophils, eosinophils, basophils, PT ratio, glucose, pO 2 , bilirubin and amylase. It cannot be determined if any of the above laboratory abnormalities were caused by the drug or the underlying condition being treated. Single oral moxifloxacin doses of 2000, 500, and 1500 mg/kg were lethal to rats, mice, and Cynomolgus monkeys, respectively. The minimum lethal intravenous dose in mice and rats was 100 mg/kg. Toxic signs after administration of a single high dose of moxifloxacin to these animals included CNS and gastrointestinal effects such as decreased activity, somnolence, tremor, convulsions, vomiting and diarrhea. The dose of AVELOX is 400 mg (orally or as an intravenous infusion) once every 24 hours. The duration of therapy depends on the type of infection as described below. *due to the designated pathogens (See INDICATIONS AND USAGE .). For I.V. use see Precautions , Geriatric Use . No dosage adjustment is required in renally impaired patients, including those on either hemodialysis or continuous ambulatory peritoneal dialysis. When switching from intravenous to oral dosage administration, no dosage adjustment is necessary. Patients whose therapy is started with AVELOX I.V. may be switched to AVELOX Tablets when clinically indicated at the discretion of the physician. AVELOX I.V. should be administered by INTRAVENOUS infusion only. It is not intended for intra-arterial, intra-muscular, intrathecal, intraperitoneal, or subcutaneous administration. AVELOX I.V. should be administered by intravenous infusion over a period of 60 minutes by direct infusion or through a Y-type intravenous infusion set which may already be in place. CAUTION: RAPID OR BOLUS INTRAVENOUS INFUSION MUST BE AVOIDED. Since only limited data are available on the compatibility of moxifloxacin intravenous injection with other intravenous substances, additives or other medications should not be added to AVELOX I.V. or infused simultaneously through the same intravenous line. If the same intravenous line or a Y-type line is used for sequential infusion of other drugs, or if the "piggyback" method of administration is used, the line should be flushed before and after infusion of AVELOX I.V. with an infusion solution compatible with AVELOX I.V. as well as with other drug(s) administered via this common line. Insert piercing pin from an appropriate transfer set (e.g. one that does not require excessive force, such as ISO compatible administration set) into port with a gentle twisting motion until pin is firmly seated. AVELOX (moxifloxacin hydrochloride) Tablets are available as oblong, dull red film-coated tablets containing 400 mg moxifloxacin. The tablet is coded with the word "BAYER" on one side and "M400" on the reverse side. Store at 25°C (77°F); excursions permitted to 15-30°C (59-86°F) [see USP Controlled Room Temperature]. Avoid high humidity. AVELOX I.V. (moxifloxacin hydrochloride in sodium chloride injection) is available in ready-to-use 250 mL latex-free flexible bags containing 400 mg of moxifloxacin in 0.8% saline. NO FURTHER DILUTION OF THIS PREPARATION IS NECESSARY. Since the premix flexible containers are for single-use only, any unused portion should be discarded. Quinolones have been shown to cause arthropathy in immature animals. In studies in juvenile dogs oral doses of moxifloxacin >/= 30 mg/kg/day (approximately 1.5 times the maximum recommended human dose based upon systemic exposure) for 28 days resulted in arthropathy. There was no evidence of arthropathy in mature monkeys and rats at oral doses up to 135 and 500 mg/kg, respectively. Unlike some other members of the quinolone class, crystalluria was not observed in 6 month repeat dose studies in rats and monkeys with moxifloxacin. No ocular toxicity was observed in a 13 week oral repeat dose study in dogs with a moxifloxacin dose of 60 mg/kg. Ocular toxicity was not observed in 6 month repeat dose studies in rats and monkeys (daily oral doses up to 500 mg/kg and 135 mg/kg, respectively). In beagle dogs, electroretinographic (ERG) changes were observed in a 2 week study at oral doses of 60 and 90 mg/kg. Histopathological changes were observed in the retina from one of four dogs at 90 mg/kg, a dose associated with mortality in this study. Some quinolones have been reported to have proconvulsant activity that is exacerbated with concomitant use of non-steroidal anti-inflammatory drugs (NSAIDs). Moxifloxacin at an oral dose of 300 mg/kg did not show an increase in acute toxicity or potential for CNS toxicity (e.g., seizures) in mice when used in combination with NSAIDs such as diclofenac, ibuprofen, or fenbufen. In dog studies, at plasma concentrations about five times the human therapeutic level, a QT-prolonging effect of moxifloxacin was found. Electrophysiological in vitro studies suggested an inhibition of the rapid activating component of the delayed rectifier potassium current (I Kr as an underlying mechanism. In dogs, the combined infusion of sotalol, a Class III antiarrhythmic agent, with moxifloxacin induced a higher degree of QTc prolongation than that induced by the same dose (30 mg/kg) of moxifloxacin alone. In a local tolerability study performed in dogs, no signs of local intolerability were seen when moxifloxacin was administered intravenously. After intra-arterial injection, inflammatory changes involving the peri-arterial soft tissue were observed suggesting that intra-arterial administration of moxifloxacin should be avoided. AVELOX Tablets (400 mg once daily for five days) were evaluated for the treatment of acute bacterial exacerbation of chronic bronchitis in a large, randomized, double-blind, controlled clinical trial conducted in the US. This study compared AVELOX with clarithromycin (500 mg twice daily for 10 days) and enrolled 629 patients. The primary endpoint for this trial was clinical success at 7-17 days post-therapy. The clinical success for AVELOX was 89% (222/250) compared to 89% (224/251) for clarithromycin. The microbiological eradication rates (eradication plus presumed eradication) in AVELOX treated patients were Streptococcus pneumoniae 100%, Haemophilus influenzae 89%, Haemophilus parainfluenzae 100%, Moraxella catarrhalis 85%, Staphylococcus aureus 94%, and Klebsiella pneumoniae 85%. A large, randomized, double-blind, controlled clinical trial was conducted in the US to compare the efficacy of AVELOX Tablets (400 mg once daily) to that of high-dose clarithromycin (500 mg twice daily) in the treatment of patients with clinically and radiologically documented community acquired pneumonia. This study enrolled 474 patients (382 of whom were valid for the primary efficacy analysis conducted at the 14-35 day follow-up visit). Clinical success for clinically evaluable patients was 95% (184/194) for AVELOX and 95% (178/188) for high dose clarithromycin. A large, randomized, double-blind, controlled trial was conducted in the US and Canada to compare the efficacy of sequential IV/PO AVELOX 400 mg QD for 7-14 days to an IV/PO fluoroquinolone control (trovafloxacin or levofloxacin) in the treatment of patients with clinically and radiologically documented community acquired pneumonia. This study enrolled 516 patients, 362 of whom were valid for the primary efficacy analysis conducted at the 7-30 day post-therapy visit. The clinical success rate was 86% (157/182) for AVELOX therapy and 89% (161/180) for the fluoroquinolone comparators. An open-label ex-US study that enrolled 628 patients compared AVELOX to sequential IV/PO amoxicillin/clavulanate (1.2 g IV q8h/625 mg PO q8h) with or without high-dose IV/PO clarithromycin (500 mg BID). The intravenous formulations of the comparators are not FDA approved. The clinical success rate at Day 5-7 (the primary efficacy timepoint) for AVELOX therapy was 93% (241/258) and demonstrated superiority to amoxicillin/clavulanate ± clarithromycin (85%, 239/280) [95% C.I. 2.9%, 13.2%]. The clinical success rate at the 21-28 days post-therapy visit for AVELOX was 84% (216/258), which also demonstrated superiority to the comparators (74%, 208/280) [95% C.I. 2.6%, 16.3%]. Avelox was effective in the treatment of community acquired pneumonia (CAP) caused by multi-drug resistant Streptococcus pneumoniae MDRSP * isolates. Of 37 microbiologically evaluable patients with MDRSP isolates, 35 patients (95.0%) achieved clinical and bacteriological success post-therapy. The clinical and bacteriological success rates based on the number of patients treated are shown in the table below. *One patient had a respiratory isolate that was resistant to penicillin and cefuroxime but a blood isolate that was intermediate to penicillin and cefuroxime. The patient is included in the database based on the respiratory isolate. **Azithromycin, clarithromycin, and erythromycin were the macrolide antimicrobials tested. *One patient had a respiratory isolate resistant to 5 antimicrobials and a blood isolate resistant to 3 antimicrobials. The patient was included in the category resistant to 5 antimicrobials. In a large, controlled double-blind study conducted in the US, AVELOX Tablets (400 mg once daily for ten days) were compared with cefuroxime axetil (250 mg twice daily for ten days) for the treatment of acute bacterial sinusitis. The trial included 457 patients valid for the primary efficacy determination. Clinical success (cure plus improvement) at the 7 to 21 day post-therapy test of cure visit was 90% for AVELOX and 89% for cefuroxime. An additional non-comparative study was conducted to gather bacteriological data and to evaluate microbiological eradication in adult patients treated with AVELOX 400 mg once daily for seven days. All patients (n = 336) underwent antral puncture in this study. Clinical success rates and eradication/presumed eradication rates at the 21 to 37 day follow-up visit were 97% (29 out of 30) for Streptococcus pneumoniae, 83% (15 out of 18) for Moraxella catarrhalis and 80% (24 out of 30) for Haemophilus influenzae . A randomized, double-blind, controlled clinical trial conducted in the US compared the efficacy of AVELOX 400 mg once daily for seven days with cephalexin HCl 500 mg three times daily for seven days. The percentage of patients treated for uncomplicated abscesses was 30%, furuncles 8%, cellulitis 16%, impetigo 20%, and other skin infections 26%. Adjunctive procedures (incision and drainage or debridement) were performed on 17% of the AVELOX treated patients and 14% of the comparator treated patients. Clinical success rates in evaluable patients were 89% (108/122) for AVELOX and 91% (110/121) for cephalexin HCl. Clinical and Laboratory Standards Institute, Methods for Dilution Antimicrobial Susceptibility Tests for Bacteria That Grow Aerobically -Sixth Edition. Approved Standard CLSI, Document M7-A6, Vol. 23, No. 2, CLSI, Wayne, PA, January, 2003. Clinical and Laboratory Standards Institute, Performance Standards for Antimicrobial Disk Susceptibility Tests -Eighth Edition. Approved Standard CLSI, Document M2-A8, Vol. 23, No. 1, CLSI, Wayne, PA, January, 2003. This section contains important information about AVELOX (moxifloxacin hydrochloride), and should be read completely before you begin treatment. This section does not take the place of discussions with your doctor or health care professional about your medical condition or your treatment. This section does not list all benefits and risks of AVELOX. The medicine described here can be prescribed only by a licensed health care professional. If you have any questions about AVELOX talk with your health care professional. Only your health care professional can determine if AVELOX is right for you. AVELOX is an antibiotic used to treat lung, sinus, or skin infections caused by certain germs called bacteria. AVELOX kills many of the types of bacteria that can infect the lungs and sinuses and has been shown in a large number of clinical trials to be safe and effective for the treatment of bacterial infections. Sometimes viruses rather than bacteria may infect the lungs and sinuses (for example the common cold). AVELOX, like all other antibiotics, does not kill viruses. You should contact your doctor if you think your condition is not improving while taking AVELOX. AVELOX Tablets are red and contain 400 mg of active drug. How and when should I take AVELOX? AVELOX should be taken once a day for 5-21 days depending on your prescription. It should be swallowed and may be taken with or without food. Try to take the tablet at the same time each day. You may begin to feel better quickly; however, in order to make sure that all bacteria are killed, you should complete the full course of medication. Do not take more than the prescribed dose of AVELOX even if you missed a dose by mistake. You should not take a double dose. You should not take AVELOX if you have ever had a severe allergic reaction to any of the group of antibiotics known as "quinolones" such as ciprofloxacin or levofloxacin. If you develop hives, difficulty breathing, or other symptoms of a severe allergic reaction, seek emergency treatment right away. If you develop a skin rash, you should stop taking AVELOX and call your health care professional. You should avoid AVELOX if you have a rare condition known as congenital prolongation of the QT interval. If you or any of your family members have this condition you should inform your health care professional. You should avoid AVELOX if you are being treated for heart rhythm disturbances with certain medicines such as quinidine, procainamide, amiodarone or sotalol. Inform your health care professional if you are taking a heart rhythm drug. You should also avoid AVELOX if the amount of potassium in your blood is low. Low potassium can sometimes be caused by medicines called diuretics such as furosemide and hydrochlorothiazide. If you are taking a diuretic medicine you should speak with your health care professional. If you are pregnant or planning to become pregnant while taking AVELOX, talk to your doctor before taking this medication. AVELOX is not recommended for use during pregnancy or nursing, as the effects on the unborn child or nursing infant are unknown. AVELOX is not recommended for children. What are the possible side effects of AVELOX? AVELOX is generally well tolerated. The most common side effects caused by AVELOX, which are usually mild, include dizziness, nausea, and diarrhea. If diarrhea persists call your health care provider. You should be careful about driving or operating machinery until you are sure AVELOX is not causing dizziness. If you notice any side effects not mentioned in this section or you have any concerns about the side effects you are experiencing, please inform your health care professional. In some people, AVELOX, as with some other antibiotics, may produce a small effect on the heart that is seen on an electrocardiogram test. Although this has not caused any serious problems in more than 8,600 patients who have already taken the medication in clinical studies, in theory it could result in extremely rare cases of abnormal heartbeat which may be dangerous. Contact your health care professional if you develop heart palpitations (fast beating), or have fainting spells. Convulsions have been reported in patients receiving quinolone antibiotics. Be sure to let your physician know if you have a history of convulsions. Quinolones, including AVELOX, have been rarely associated with other central nervous system events including confusion, tremors, hallucinations, and depression. Quinolones, including AVELOX, have been rarely associated with inflammation of tendons. If you experience pain, swelling or rupture of a tendon, you should stop taking AVELOX and call your health care professional. What about other medicines I am taking? Tell your doctor about all other prescription and non-prescription medicines or supplements you are taking. You should avoid taking AVELOX with certain medicines used to treat an abnormal heartbeat. These include quinidine, procainamide, amiodarone, and sotalol. Some medicines also produce an effect on the electrocardiogram test, including cisapride, erythromycin, some antidepressants and some antipsychotic drugs. These may increase the risk of heart beat problems when taken with AVELOX. Many antacids and multivitamins may interfere with the absorption of AVELOX and may prevent it from working properly. You should take AVELOX either 4 hours before or 8 hours after taking these products. Take your dose of AVELOX once a day. Complete the course of medication even if you are feeling better. This information does not take the place of discussions with your doctor or health care professional about your medical condition or your treatment. For more complete information about AVELOX request full prescribing information from your health care professional, pharmacist, or visit our website at www.aveloxusa.com. AVELOX is a registered trademark of Bayer Aktiengesellschaft and is used under license by Schering Corporation.